Yep, those nice guys out there who are trying to be all sweet and cook a fancy Valentine’s Day meal. If you happen to have (or be) one of those guys, might I just say to the girls, you are very lucky, you should probably hold on tight. Any guy that wants to cook for his girl is a keeper in my book. All the guys I know think girls should be in the kitchen and guys on the couch. Yeah, I know, what era are they from? Maybe I should find some better guys to hang out with? Yup, ah huh. That’s for sure. ANYWAY, this pasta, this recipe and really this idea, should all be credited to my cousins, Maggie and Abby (Heyyy). The idea for a “Man Proof” pasta was all Maggie’s idea (aka Marge). She’s the only one of us three girls with an actual boyfriend, but umm Abby and I both agreed that we’d like to find us a man who could make us some fancy lobster pasta, so I went with. Now obviously, anyone can (and should) make this, especially anyone just looking for a really good, really easy meal. But if there are any guys out there reading, I am thinking you will get major bonus points if you make this. Promise, you can do it. It took me a while to actually decide on the flavors I wanted for this pasta, I had so many ideas – just ask my cousins. I think I texted them like twenty different ideas. Thankfully they are totally cool and don’t get annoyed by my constant texting… and they have good taste, so we figured it out. 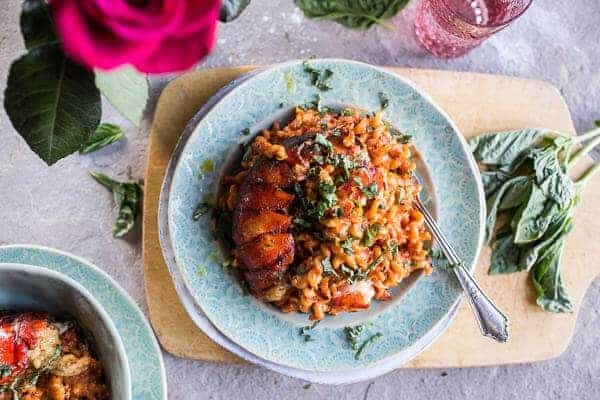 We kept coming back to the classic creamy tomato, so I just took that idea and basically made it easier and with a little Indian twist, that pretty much makes ALL THE DIFFERENCE. Hello. Basil Curried Butter…all toasty and browned. I contemplated using cilantro because I love it, but I love basil just a little more, so basil it was. Trust me on this, the butter is everything. I mean, lobster and butter? They just go hand in hand. Throw in some spicy curry powder and basil? Yup. Perfection. 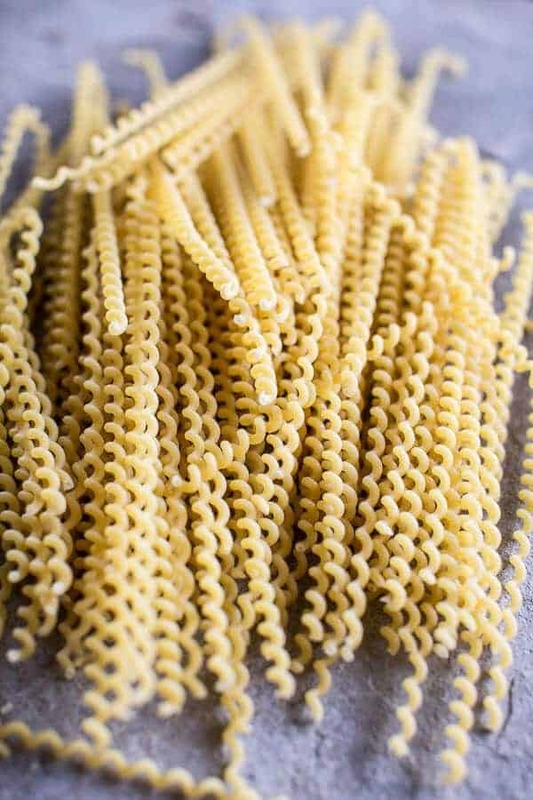 Here’s the thing, this pasta is so easy, but it does have some steps. I know an idiot proof recipe shouldn’t have a whole lot of steps (and this doesn’t), but there is always a little work when lobster is involved. The sauce is SIMPLE. Just cook some garlic in oil, add some tomatoes, basil and wine (yup, yup) and simmer. You even get to cook the pasta right in the sauce, which ends up making this a two pot meal. You can simmer the sauce for however long you you’d like, but the pasta only needs twenty minutes to cook, so just be sure that if you are making the sauce early in the day, not to add the pasta until right before serving. 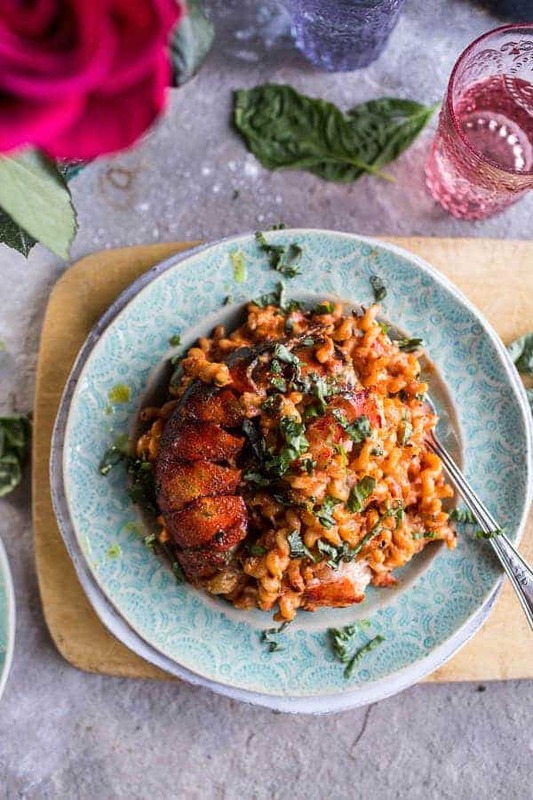 While the pasta is cooking, you’re gonna need to be searing the lobster tails. I did mine in a grill pan, but a grill or cast iron skillet will work just as well. 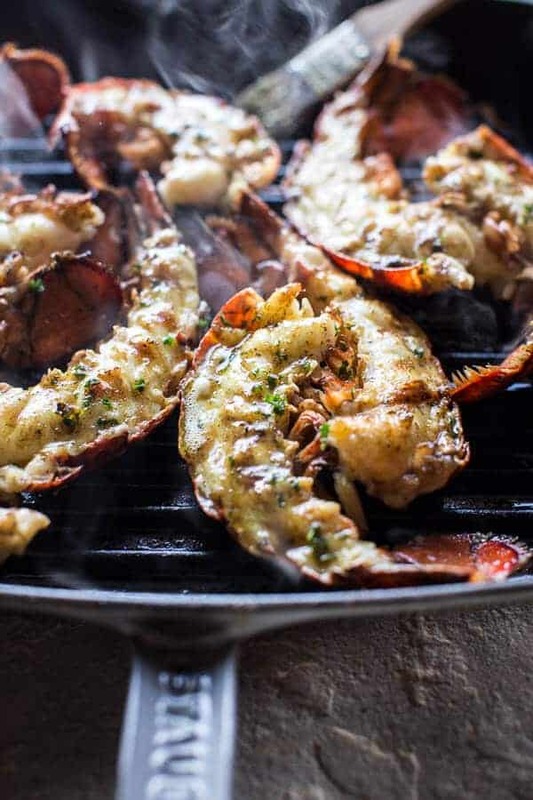 I think the easiest and tastiest way to cook lobster is to cut it in half, grill it and then slather it in butter. I mean, so good. 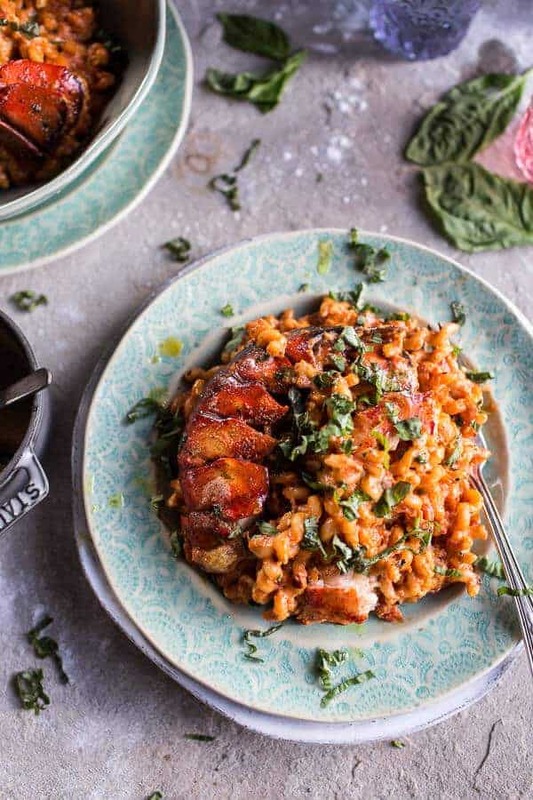 Once the pasta is cooked and the lobster is grilled, just toss it all together and DONE. See, pretty easy, right? And no crazy odd ingredients either!! Told you guys, you can do this. Also, bottom line of this post? 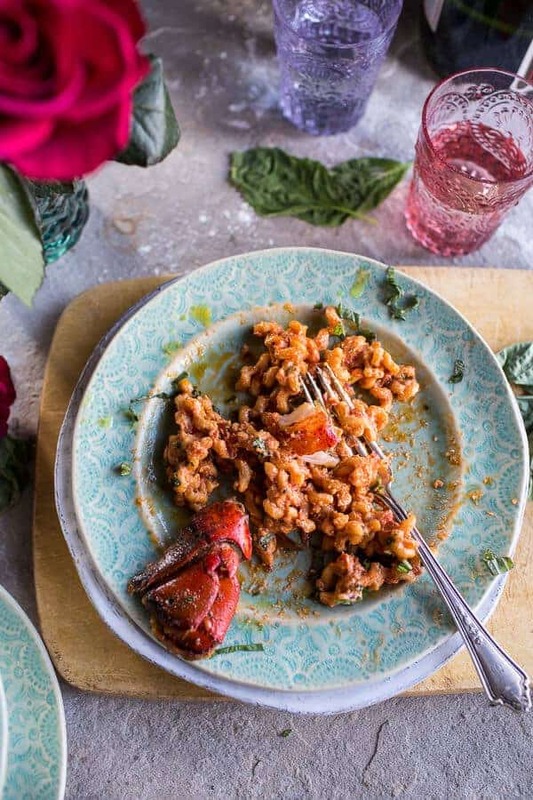 If your guy makes this creamy tomato and curry butter lobster pasta for you? Idiot Proof Creamy Tomato and Curry Butter Lobster Pasta. Heat the olive oil over medium-low heat in a large pot. Add the garlic and chili flakes and cook for 5 minutes or until the garlic is fragrant. Watch the garlic carefully, if it burns you have to start over. Stir in the tomato paste, tomatoes (crushing them with your hands as you add them), basil and oregano Stir to combine. Add the white wine and water, cover and simmer until ready to cook the pasta. About 20 minutes before serving, add the pasta (breaking it up if needed) to the sauce and simmer for 20 minutes until pasta is cooked through and the sauce is reduced. Meanwhile, cook the lobster. Use kitchen shears or a very sharp knife, cut the tail right down the center. Rub the flesh of the lobster with olive oil, season with salt + pepper. Heat a grill, grill pan or cast iron skillet over high heat. Once hot, place the lobster, flash side down on the hot grill (or pan), cook for about 5 minutes and then flip the tails over and brush with the curry butter. Continue cooking for another 3-5 minutes or until the shells are bright red. Remove from the heat. 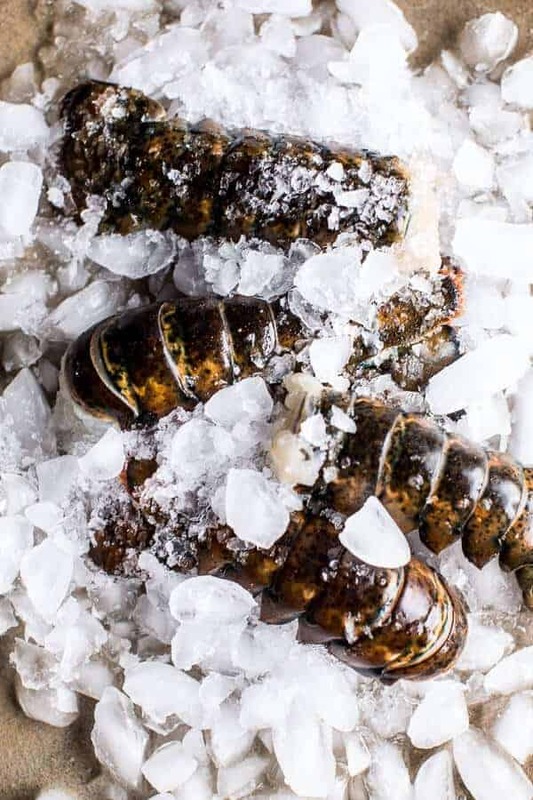 Remove the lobster from its shell and dice into bite size pieces. Once the pasta is cooked, stir in the cream cheese and cream until melted. Toss in the lobster. Top the pasta with fresh basil and drizzle with any remaining curry butter. Enjoy! Eat the leftovers all week long! He’s KEEPER. Pasta, butter, lobster – great guy. YES. But I can’t eat seafood so that guy out there if I ever meet one– can make it with chicken or sausage. Ooops–that is a perfect rose! Thanks for “idiot proofing” this for me! I seem to spend too much time in the company of guys who get to sit on the coach and read the paper/watch sports while I cook, clean, get stressed out and fuss way too much. Would love to enjoy this on V-day instead of going out ~ gave up on that years ago, restaurants way too crowded, bad service (not the servers fault, just too much work for them to do) and so on. Idiot proof? Hmmm. Better send this link to my husband to get his view. That used to be the joke at work when someone dropped the bomb on a technical issue…..oh, they must be dealing with an I D 10 T issue. get it?!? I don’t know that I could trust my husband to make this for me, despite you calling it idiot proof. He burns pre-made chicken nuggets. HO-EV-ER, maybe I’ll make it instead because curry and lobster? I LUHVE. Pinned! This looks fantastic, but I am not a lobster eater 🙁 I know, but I would make this sans the lobster and I bet it would be fantastic! 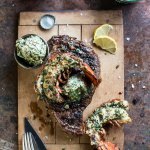 I just showed this to my husband and we may just make this together on Valentine’s day he can grill the lobsters while I make the sauce and eat Godiva truffles. Your recipes rock..I can’t get enough of your blog. This looks AMAZING!! 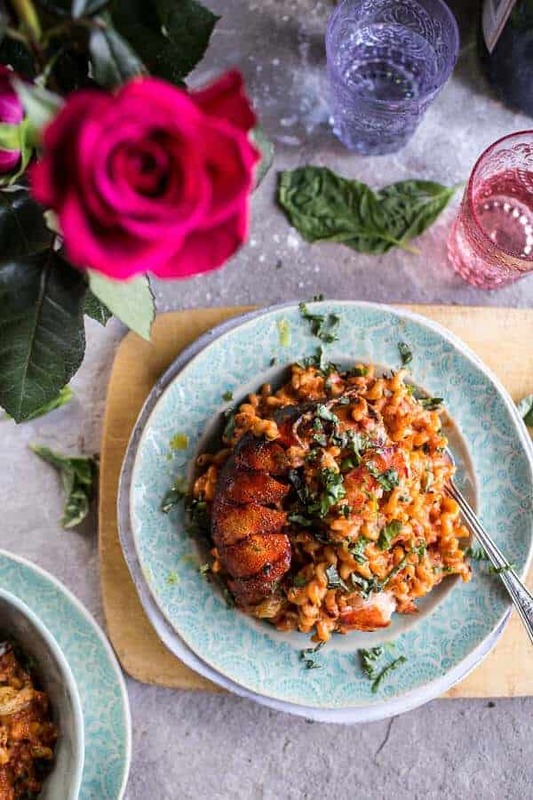 I do all the cooking in our house (which I love), and will definitely be making this for Valentines Day dinner! Love your recipes! OMG I sooooo need to try this! I love the idea of the curry, I can totally see this working! Tieghan, I always love your idiot proof recipes. I don’t know if it’s just the name or how easy they are but they are some of my faves. I also thinks it’s a great idea that you’re catering this one to all the guys. It’s perfection! 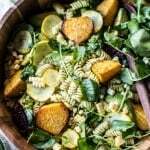 This is by far the most gorgeous pasta recipe I’ve ever seen! Love the lobster here! You make this sound so easy! We did not grow up eating seafood in my home so cooking it is this giant mystery to me, but this makes me feel like it is almost possible! I keep trying to stop drooling but it isn’t working. I have always found cooking with lobster tails so intimidating – thank you for making it more accessible! I can’t wait to try this this weekend. Please be my valentine. I have beer. Hello! This looks absolutely AMAZING. The fact that it is man-proof puts it on a whole other level. Wow this looks so good–forget the Valentine I want this just for myself!! Pinned! This looks absolutely amazing. Being from Maine I am used to lobster. It is one of my favorite thing but even for me it is a special treat. 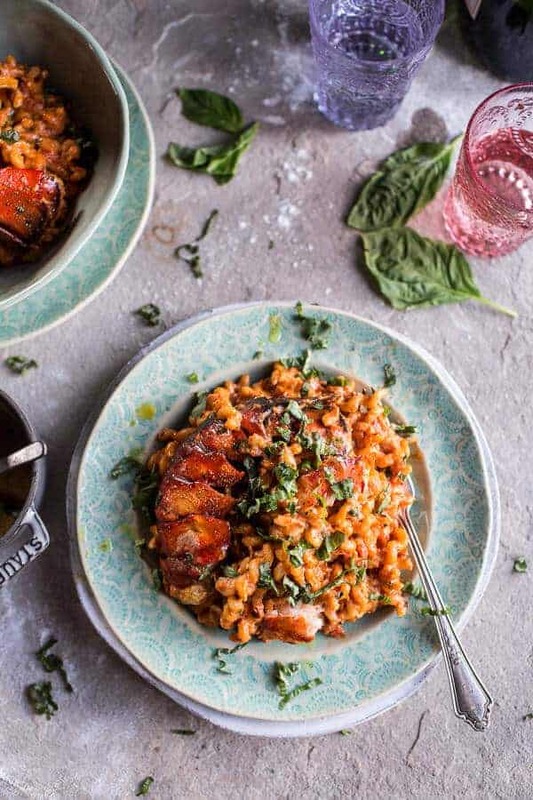 I’m pretty sure my husband will not be making me dinner this weekend but I will say that this looks so good that I want to make it for myself. I need to e-mail this to my hubby stat. What could be better than fresh lobster and pasta. My hubby cooking it!!! We live in New England so fresh lobsters will be a plenty in the summer. This is perfect, everything about it! Beautiful photos as always! Mmm, this looks great! 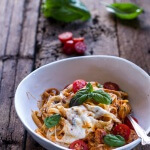 Love creamy tomato sauces, definitely one of my favourite pasta toppings. I have a slightly unrelated question: I’m just wondering what dimensions you use for your photos in your blog posts? 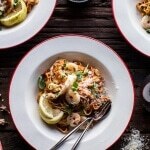 This pasta is just what I need for Valentine’s Day, I’m obsessed with the basil butter! This looks so crazy good, I can’t even tell you!!!! Ugh my stomach is eating itself and this is just killing me in the best most delicious way! 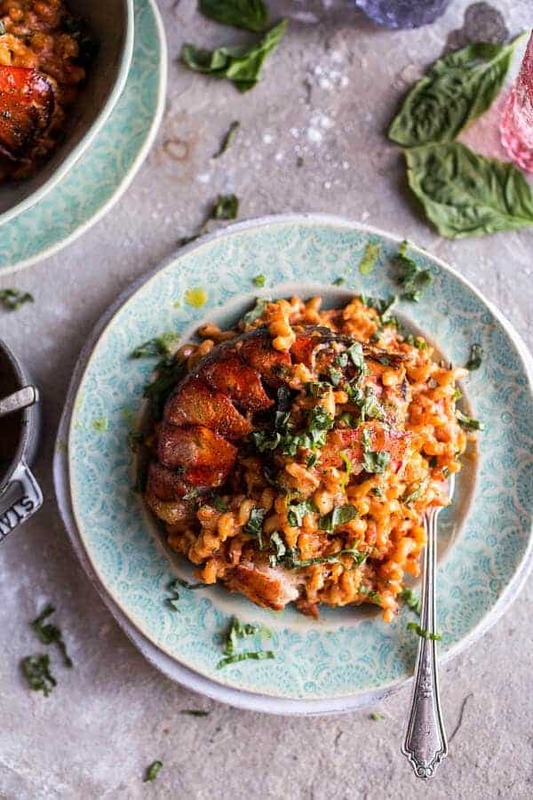 Yum – think I’m going to try this as a risotto with Wild Georgia Shrimp (gotta go with what they pull out of the ocean right here in my neck of the woods)! 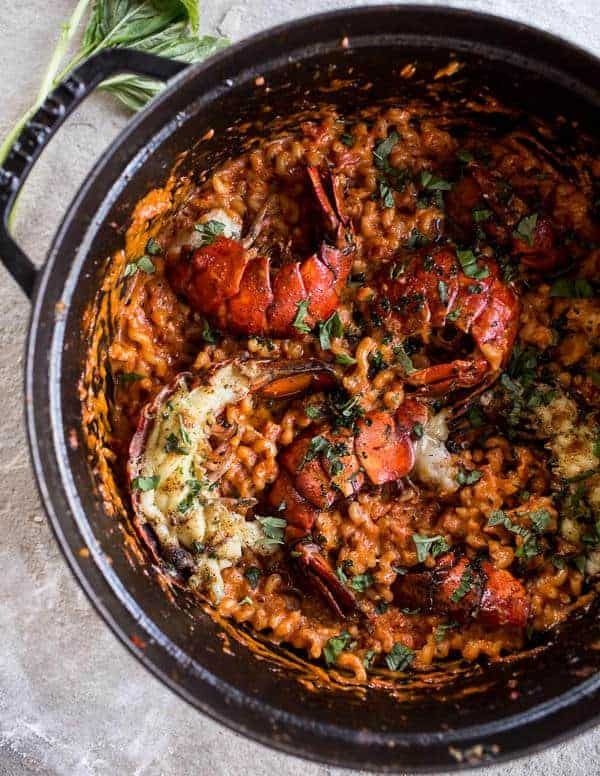 I’m having trouble understanding the curry butter step – you rub the lobster with olive oil, melt the butter and curry together in one pan, and then add the lobster to a different pan to cook, thennnnnn in the end drizzle the butter over the entire thing? Sorry, I read it a few times trying to make sense of it and I really want to make this this weekend!!! Hey Alexandra, yes, that is correct. You rub the lobster with olive oil so it does not stick to the pan and then once the lobster has been cooked, you then rub the curry butter on for flavor. Sorry if that was confusing. This looks really interesting. Cream + curry + lobster… Definitely sold! This looks AMAZING! I’m practically licking my monitor. But my husband is not a fan of curry. What other spice might work in its place? Or could I just leave it out entirely? Hey Karen, you can just leave it out entirely or replace it with chili powder or a favorite spice of yours. Hope you both love this! Thanks! Can’t seem to reply to your reply re chili powder, but thanks! And now I’m thinking maybe smoked paprika…! Hey Tieghan, I’m making this tonight for my wife and she’s on a medication right now that if she even has a little bit of alcohol she would become very ill. I know the alcohol in white wine will cook out, but if i want to play it safe, is there anything you would suggest substituting for it? Thank you. Holy cow. We both loved it. I was surprised by how easy it was! Thank you so much. I made this tonight for my man since yesterday there was a hockey game and we were at a friends place, so our V-Day dinner had to wait one more day!! This recipe is great. Extremely rich because of the cream, oil and butter but SO worth it. I served this with fresh baked baguette and broiled herbed asparagus. The fresh basil really makes this.. I kept adding extra.. mmmmm!!! Thank you for the recipe! The lobster was a nice treat. SO happy you loved this, THANKS!! AMAZING recipe!! Made this tonight for our Anniversary dinner and my husband and I both absolutely loved it!! Used a few substitutions because we can’t have dairy, but it turned out fabulous! The curry powder gave it a really nice twist on the typical Italian pasta with tomato sauce. You never disappoint us Tieghan!! Awesome recipe!!! I have to tell… the leftover curry/basil butter make an excellent dipping sauce for some Ciabatta bread warmed in the oven. Keep the great recipes coming!!! Alright so this looks amazing, and will definitely be making this for my GF. However, one question about the sauce, when you say crush up the tomatoes, what do you mean exactly and what kind of tomatoes? Are you coring them or? I’m mostly competent in the kitchen but I’ve never made a pasta sauce without using canned tomatoes (and I’d like to try fresh instead). 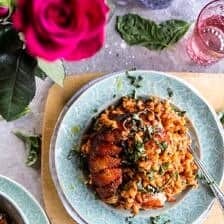 I actually used whole peeled canned tomatoes in this recipe and just crushed them with the back of my spoon while they are simmering in the sauce. Does that answer your question?? Hi 🙂 what curry powder and white wine would you recommend? I like to use spice Islands Spicy Curry Powder and use whatever white wine you would drink. Let me know if you have any other questions. Hope you love the pasta and have a great weekend! What do you suggest serving with this great recipe? HI! I would do a salad and a lite oil/vinegar dressing. I think a balsamic or red wine vinegar dressing would be simple and great. Hope you love the recipe. Thanks! If you don’t mind me asking, where do you buy your dinnerware? Would you mind doing a post on your dinnerware and serveware collection? It’s stunning! I’m starting from scratch and need inspiration. Help!! Oh a post on dinnerware sounds so fun, great idea! 🙂 I buy a lot from Anthropologie and Crate and Barrel. Let me know if you have questions. Thanks! Could you use red curry paste instead of yellow curry powder? How should I adjust the recipe if I’m using already cooked pasta?